VIPAccessEXCLUSIVE: Alexisjoyvipaccess Covers The Streamy Awards Nominees Reception Event – RECAP Here Plus Find Out 30 Winners At The Streamys! T-minus 2 more days until one of the greatest and most unforgettable days in online video-making history: the one and only 2016 Streamy Awards! What started off as one person putting up an amazing video on YouTube has now become an entire community creating, inspiring, and influencing others to be themselves and join in on all of the fun. That’s what the Streamy Awards are all about – showing how one video, one Vine, one live-stream, and more can impact the lives of many. The winners of 14 incredible categories will be announced at this year’s award show taking place on October 4, 2016 at the Beverly Hilton and hosted by none other than Vine sensation, writer, and actor King Bach. The categories include Actor, Actress, Beauty, Breakout Creator, Comedy, Fashion, First Person, Lifestyle, Snapchat Storyteller and Viner, Feature, Live and the two Audience Choice categories – Entertainer of the Year and Show of the Year (source: press release) at 9 PM ET / 6 PM PT on the Streamy Awards’ YouTube channel. With so many other phenomenal and remarkable categories recognizing the many impactful YouTube stars and online video creators, a marvelous Streamy Awards Nominees Reception Event took place yesterday, October 1, 2016 at the YouTube Space LA to honor thirty of the fantastic winners at this year’s Streamy Awards. It is always so incredible to see how all of these magnificent creators join together to support one another and celebrate how far the world of online video making has come and will continue to flourish. In addition to having so many remarkable content creators together, the event was filled with great music, a delicious donut wall, a spectacular after-party and a terrific photo-truck opportunity. The Streamy Awards is such an inspiring and outstanding award show that celebrates all of the positivity that the online video-making community has offered. This year’s award show is bound to be even more epic, extraordinary, and awe-inspiring than the years before and with all of our favorite content creators under one roof, we know that we will be nothing short from mesmerized after tuning in to this excellent award show. Additional creators were announced to be presenting at this year’s award show including Flula Borg, Shay Carl, Gabriel Conte, Philip DeFranco, Yousef Erakat, Brittany Furlan, German Garmendia of HolaSoyGerman, Gigi Gorgeous, Joey Graceffa, GloZell Green, Grace Helbig, Jenna Marbles, Jenn McAllister, Tyler Oakley, Logan Paul, Rhett & Link, Andrea Russett, Lilly Singh,Anthony Padilla and Ian Hecox of Smosh, Superfruit, The Try Guys, James Van Der Beek and What’s Up Moms (source: press release). In addition, New Girl‘s Lamorne Morris will be making a special appearance. I, Alexisjoyvipaccess had the great honor of covering and attending the 2016 Streamy Awards Nominees Reception event hosted by Hunter March and Chelsea Briggs yesterday. Check out some VIPAccessEXCLUSIVE pictures below from my coverage of the event and stay tuned on YouTube.com/alexisjoyvipaccess for interviews with SMOSH’s Anthony Padilla, the Merrell Twins, Sawyer Hartman, Hunter March and Jordan Doww. Be sure to continue to get your votes in for the Audience Choice Categories – “Entertainer of the Year” and “Show of the Year,” which will both be announced the day of the award show on October 4th. For more information on how to get your votes in and who is nominated for the Audience Choice Categories, you can head on over here. 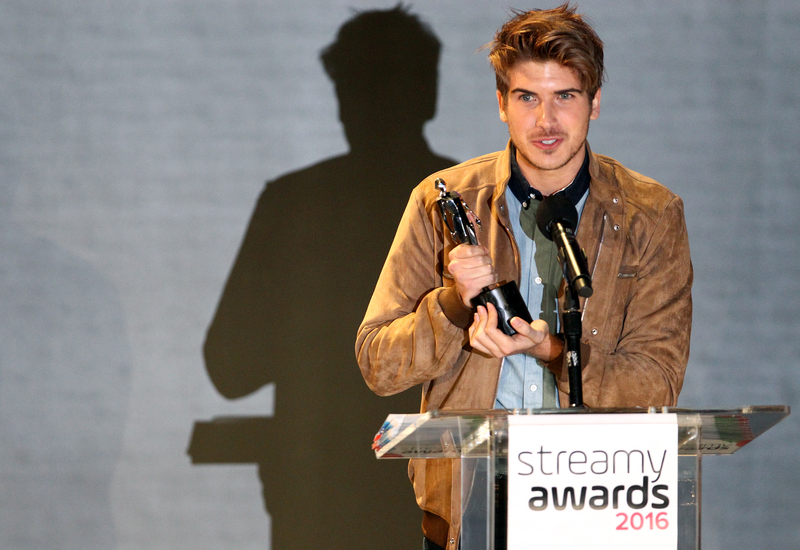 Check out the 30 winners announced at last night’s 2016 Streamy Awards Nominees Reception Event below (source: press release) and be sure to tune in to the 2016 Streamy Awards on October 4th at the Streamy Awards YouTube channel at 9 PM ET / 6 PM PT. Here at Alexisjoyvipaccess.com, I’d like to send a big congratulations to all of the 30 winners announced at last night’s Streamy Awards Nominees Reception Event! Yet another one of the winners’ many exceptional achievements that they truly deserve. Stay connected with the 2016 Streamy Awards by following the Streamys on Twitter and Instagram: @Streamys and join in on the conversation by using #Streamys. Also, stay connected with the Streamys on Facebook, Tumblr, Vine and Snapchat – username: streamys! Previous VIPAccessEXCLUSIVE: Alexisjoyvipaccess Attended The Remarkable “The Handmaiden” Movie Premiere – RECAP Here! Next Article: You’re Invited To Rydel Lynch’s Tea Party With Home & Family TV – Pics Here!